Rachel Brosnahan cozies up to husband Jason Ralph as they arrive at the opening night of What the Constitution Means to Me on Sunday night (March 31) at the Helen Hayes Theater in New York City. The 28-year-old Marvelous Mrs. Maisel star looked super chic in a striped suit as she showed her support for the new Broadway show. Also stepping out for opening night was Josh Groban and his girlfriend Schuyler Helford. What the Constitution Means to Me will be running on Broadway until June 9 – check out tickets here. Rachel Brosnahan & Jason Ralph Couple Up at Roundabout Gala Honoring John Lithgow! Rachel Brosnahan strikes a pose on the carpet while attending the 2019 Roundabout Theatre Company Gala held at The Ziegfeld Ballroom on Monday (February 25) in New York City. The 28-year-old Marvelous Mrs. Maisel star was joined by her husband Jason Ralph, Laurie Metcalf, Annette Bening, Ethan Hawke and his wife Ryan, Carla Gugino, Anna Chlumsky, Blythe Danner, Vanessa Williams and Idina Menzel, who gave a special performance at the event. John Lithgow, the upcoming star of Lucas Hnath‘s Hillary and Clinton was honored with the Jason Robards Award for Excellence in Theatre. The Jason Robards Award for Excellence in Theatre is named after the late Jason Robards for his longstanding relationship with Roundabout and memorable body of stage work. It is given to those who have made an indelible impact on both Roundabout and the theater world. Rachel Brosnahan & Husband Jason Ralph Couple Up at BAFTAs 2019! Rachel Brosnahan walks the red carpet with her husband Jason Ralph at the 2019 EE British Academy Film Awards on Sunday (February 10) at Royal Albert Hall in London, England. The 28-year-old actress, who has won every award imaginable for her work in the Amazon television series The Marvelous Mrs. Maisel, is a presenter at the event. Rachel recently revealed that she and Jason have been married for longer than we thought! FYI: Rachel is wearing a custom Erdem gown. Jason is in Prada. 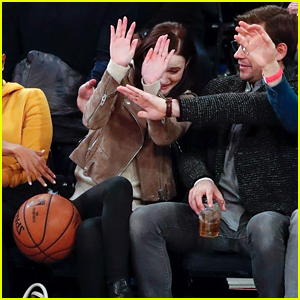 Rachel Brosnahan tries to block a basketball coming her way while sitting in courtside seats at the New York Knicks vs. Boston Celtics game on Friday (February 1) at Madison Square Garden in New York City. The 28-year-old The Marvelous Mrs. Maisel actress was joined by husband Jason Ralph, who held out a hand to block Rachel‘s face from the ball. The ball ended up hitting Rachel in the thigh, but it looks like she’s okay! Sitting a couple seats away from Rachel during the game was Orange Is the New Black actress Uzo Aduba. FYI: Rachel is wearing a [BLANKNYC] jacket. Rachel Brosnahan and Tina Fey walk the carpet while attending the 2019 Artios Awards on Thursday (January 31) in New York City. Darren Criss also stepped out that evening for the Artios Awards, but he attended the west coast event in Los Angeles! The Artios Awards celebrate excellence in casting. In NYC, Rachel and Tina were joined by their respective husbands Jason Ralph and Jeff Raymond, as well as Pose‘s Billy Porter and MJ Rodriguez, Unbreakable Kimmy Schmidt‘s Jane Krakowski and Tituss Burgess, Edie Falco, Danielle Brooks, Bridget Everett, Patricia Clarkson, Zachary Quinto, Alessandro Nivola, and Broadway stars Brian D’Arcy James and Ari’el Stachel. On the west coast, Darren was joined by his Glee co-star Amber Riley, as well as Laura Dern, Paul Scheer, and June Diane Raphael. FYI: Rachel is wearing a Christian Siriano dress. Rachel Brosnahan Reveals She's Been Married to Jason Ralph For Years! Rachel Brosnahan has been married for years! The 27-year-old The Marvelous Mrs. Maisel actress and her husband Jason Ralph were thought to have tied the knot in early 2018, but that’s not the case! Rachel just revealed that she and Jason have been married for quite some time. “We’ve been married for years and been together for even longer. We had a good laugh when the news came out that we had just got married, like, ‘Happy six-month anniversary, honey!’” Rachel told People. Rachel and Jason first met in 2015 while working on the WGN series Manhattan.